Good to see you all back for another ��Magnet School Monday� - it�s time for your second seminar on �ochige�, or �falling object� puzzlers. The titles we covered in Ochi 101 were a relatively �traditional� sampling, but now that those are under your belts we�ll be venturing into less-familiar territory. It�s still about stacking pieces and matching colors, but don�t get complacent: this is Ochige 201, and you�re expected to be beyond the �this is all too weird for me!� stage by now. No more grading on a curve � let�s get to it! What Is It? � Fuuki is another (now-dead) developer you probably haven�t encountered before; fighting game enthusiasts might know of their weapon-based Asura Blade and its sequel Asura Buster, but even that�s a big �maybe�. Back in 1996, the company decided to try its hand at making a puzzler: this appears to have been both its first and last foray into the genre. Remarkably, however, Fuuki produced better results in one go than more prolific outfits usually manage over years of repeated attempts: read on to find out just how they did it. How Does It Work? � When you first boot Gyakuten up, there�s no question that you�re back in ochige territory � colored blocks, two at a time, make groups of three, potential for chaining, yadda yadda yadda. A glaring abnormality, however, immediately catches your eye: some of the blocks you get are �big� while others are �small�. Both sizes take up the same amount of individual space and can be used interchangeably when forming matching sets, but the key difference between them goes beyond mere appearances. Watch what happens when you put together a same-colored group of three: any �big� blocks in the set will vanish, but �small� pieces will remain, and grow into �big� ones. This little quirk has huge ramifications � for one thing, �growing� pieces count as �hits� in a chain just like �disappearing� ones do, effectively giving �small� blocks the ability to �hit� twice. Put together a compatible trio of minis, and they�ll react once when they all grow to full size, and then react again when the three newly-formed big pieces combine and blip out completely. Bam � an instant 2-hit �chain�. Exploit this feature along with �traditional� chains and you can cook up some monster combos. Careful, though: the presence of �growing� blocks makes it trickier to put really huge reactions together, since here a color match won�t always leave a completely clear space behind it � an unwanted remaining piece that you counted on being gone can seriously muck up your plans. This new variable takes a bit of getting used to, especially since the game�s pace speeds up so quickly, but, as you�ll see in a minute, it�s totally worth it. This title�s second distinguishing feature, as it happens, is found in its name: �gyakuten� means �reversal� (or �turnabout�, as in Gyakuten Saiban, the Japanese name for the Ace Attorney games), thus it�s no surprise that counter-attacks are a key part of your strategy here. Unlike in most competitive puzzlers, enemy garbage is not �cleared out�, but �converted� � any trash pieces adjacent to disappearing �big� blocks (�growing� minis have no effect) are transformed into �small� blocks of that color. Moreover, �converted� bits are immediately ready to activate if enough suitable partners are nearby: if you can set something off in the right spot, an opponent�s once-harrowing tower of attack pieces, in one fell swoop, now comprises a fully-loaded revenge platter special with a side of curly fries. Why Should I Play It? � To be clear, Gyakuten, is not the first or most famous puzzler to utilize the �big/small� and �counter-garbage� mechanics � it is, however, one of the few which avoids a distressingly common trap of inherent design imbalance. While most games built around counterattacks treat �small� pieces as inert, basically another form of garbage block which can be easily put aside until the optimal moment, Gyakuten�s possess as much volatility as �normal�-sized ones, and are thus much tougher to �stock up� effectively, especially since they can�t be used to convert garbage until they�ve grown. This might sound like a negative point offhand, but play some of the competition and you�ll quickly see why Fuuki chose this path � setting off absolutely massive reversals in similar games is usually far too easy, effectively handing victory to whomever can sneak in (or stumble upon) a one-hit KO first. Players can still make big things happen in Gyakuten, but they�ve really got to earn it � carefully sorting everything into place to punch your opponent in the face truly feels like a feat worth celebrating. By the way, when I say �punch your opponent in the face�, I mean it LITERALLY. Where Can I Find It? � Unfortunately, unless you�re in the arcade PCB market a �legitimate� copy of Gyakuten is out of your reach � the game was never ported to any home system. Fortunately, it is fully emulated, so players can at least give it a try; I�ve no idea who (if anyone) owns the rights to Fuuki�s properties these days, but if anybody knows be sure to pass the word along, so as to start up the inevitable (and doomed to failure) e-mail campaign to finally give most of us an honest shot at this title. Anything Else? - Konami�s Taisen Puzzle-dama and Taisen Tokkae-dama series (not to mention fantasy-themed clone Karian Cross) are probably the most popular and best-known variations on this general gameplay theme, but as you can observe from the linked videos they�re too glutted with easy reversals for my tastes; I�d personally recommend Aquarium, Emeraldia, or Pikiinya instead. Though there�s a decided and unfortunate dearth of face-punching to be found in any of them. What Is It? � If you�ve ever heard of developer Seibu Kaihatsu before, it�s probably for one reason, namely their Raiden series of scrolling shooters (which, at this point, has been unofficially inherited by MOSS) � it sure as heck wasn�t due to their prolific puzzle output, that much is for certain. 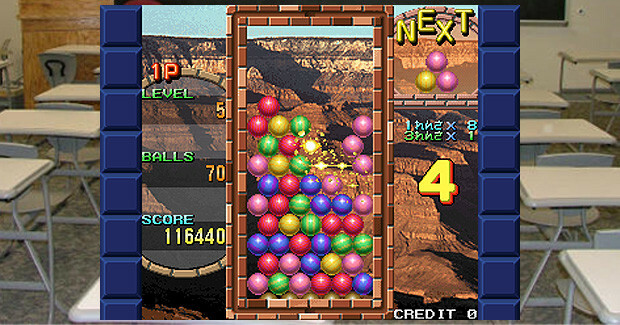 This isn�t to say that only Seibu�s shooters are worth playing � case in point, this ochige from 1995, also called Battle Balls, Ikuse Tama-O, and heck, probably a few more names I�m not even aware of. As with Gyakuten, if you�re only going to do it once, you might as well do it right! How Does It Work? � The gimmick on display here is perhaps the simplest of any game �Magnet School covers. Colored balls drop in compact clusters of three, matching up four or more will spirit them away�and aside from the usual chaining, that�s about it! The underlying setup might sound a bit too minimalist, until it becomes evident that this game�s balls (�that sounded wrong) aren�t merely abstract place-holders, but act like solid spheres do in real life. For starters, your pieces aren�t �glued together� � as soon as they land, if there�s nothing to hold them in place gravity will separate them, and individually they�ll roll right along until a suitable resting spot is found. It�s a bit like Monster Slider, but you have no direct control whatsoever on where these orbs go; it all depends upon where you choose to start them off, and how well you can predict the gravity-based outcome of each initial placement. The same principle applies to building chains: when a group of four disappears, the pieces directly above them won�t just fall straight down, but other newly-loose nearby balls will also filter into the gaps left behind. Knowing which colors will be rolling into which spots is crucial for setting up other pieces to meet them and clear out more stuff in one go � succeed, and a unique type of �garbage block� is sent your opponent�s way. These little buggers actually �eat� any colored pieces they touch, imprisoning them inside themselves and preventing them from forming matches � clear away a set next door, though, and they�ll release their prey, which becomes immediately reactive. If you can work your way out of a jam with enough aplomb, the opposition may well have a Big Fat Greek Counter-Assault on their hands. Why Should I Play It? � Senkyu�s greatest strength lies in its simplicity � unlike some of the other puzzlers in here, it doesn�t swamp players with a whole lot of disparate gameplay mechanics or other �layers� to juggle. �Drop the balls, watch �em roll, match �em up� is really all there is to it � from there it�s just a matter of how skillfully you can make it happen. Just because this game is easy to pick up isn�t to say it�s a cake walk, though � the computer is quite tough, even by puzzle standards, and will test your skills right from the beginning (and if you manage to find yourself a worthy human opponent, prepare for some major fireworks). Adjusting the way you approach chain-building is the key � straight-down dropping is no longer the only follow-up reaction you need to consider, as surrounding pieces will move in various ways depending on the shape of the formation you just cleared. There�s really no way to master this unique setup save experience: once you�ve gotten the hang of how the pieces flow, there are many impressive screen-clearing feats to be wrought. Fortunately, Senkyu�s structure is also forgiving enough to soften up the rough patches. For starters, while �splitting� formations up seems (like everything else) a bit awkward at the start, it soon becomes evident how useful it can be to wedge a group on top of a central spire and roll the fragments down to two opposite ends of the board - if you�re crafty enough, distance is rendered largely irrelevant when you�re putting together a mid-match strategy. The rounded shape of the pieces also expands your match-up options � if one circle touches another in any direction it�ll count, so just doing your best to keep like colors in each others� general vicinity will be enough to earn you some success while you get your sea legs. Finally, since the balls (including garbage pieces) are engineered to fill in gaps as they arrive, there�s almost no risk of sudden death: the entire board will likely need to be packed to capacity before a loss, meaning you�ll almost always have some time to formulate an escape plan. Simple yet complex, user-friendly yet challenging, Senkyu has something to offer just about any type of puzzle fan. Where Can I Find It? 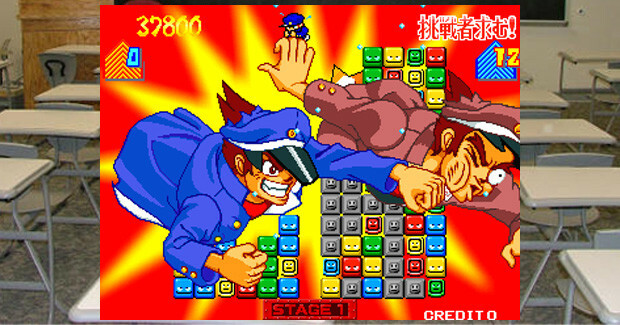 � The initial arcade release of Senkyu can be emulated, though a Japan-exclusive PS1 port (often listed as Mezase! Senkyu-O) also exists � it�s a faithful conversion, though it doesn�t include much in the way of extras and can be a tad tricky to find, despite receiving a reprint. Those seeking a small taste of the action might want to keep an eye out for the first edition of Raiden DX on the PS1, not just because it�s a great shmup, but because a demo of Senkyu is included on the disc. 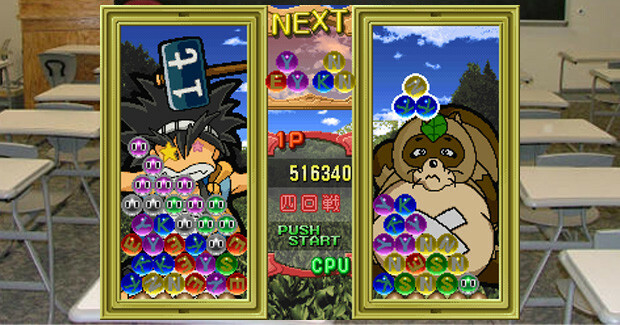 As Seibu Kaihatsu became desperate for income, the game was later re-skinned and re-released to arcades in two NSFW variations, the Gravure Collection and Pakkun Ball TV; info on both is scarce, which is probably for the best. Anything Else? 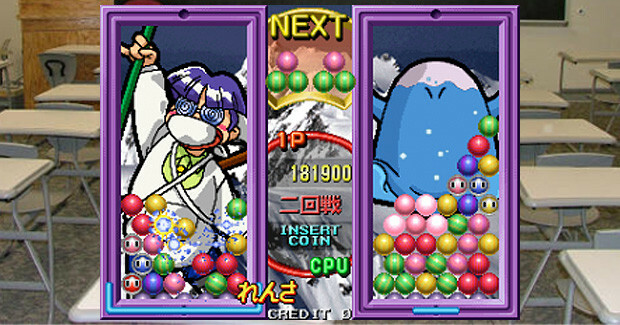 � Interestingly enough, another shmup-centric company, namely Cave, took a similar route to Senkyu�s when they took their own shot at the puzzle genre: Uo Poko (which was later �remixed� into Mushihime-tama) is also centered around �beads� which will roll into free gaps as space is cleared out. 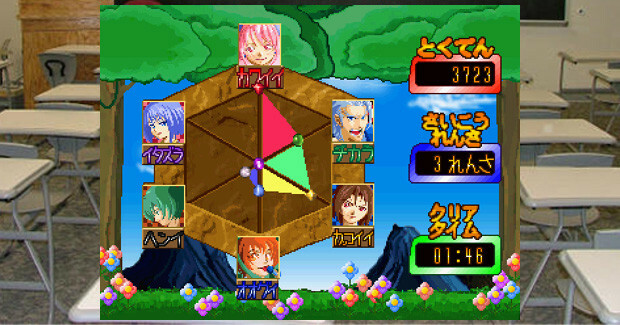 Unlike Senkyu, though, you start with a pre-filled screen and must empty it before time runs out, using a joystick-charged �launcher� to shoot pieces across the board; Pastel Muses adopted a similar mechanic around the same time. Otenki Kororin (aka Weather Tales), by yet another shmup developer, Takumi, also utilizes �rolling� pieces within a framework somewhat similar to Yoshi�s Cookie. Too bad Raizing never took a shot at making a puzzler�hold out hope for Treasure to do one someday! What Is It? � How many of you out there still remember when everyone and his uncle wanted (and was nervy enough to try to steal) a piece of the Pokemon craze? 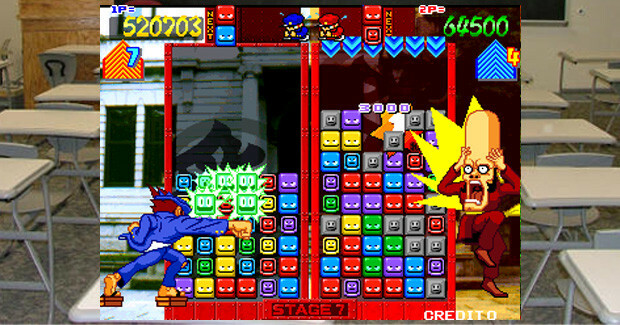 Well, in 1998 Altron (whose output in recent years has consisted almost exclusively of portable licensed titles) eagerly squeezed itself onto the bandwagon, in the form of a puzzle game�if you can believe it, though, the result is NOT another soulless, disposable cash-in! Honest! It�s actually really�huh? C�mon, stop looking at me like that � would I lie to you? Just keep reading! How Does It Work? � Despite being an ochige, Waku�s interface shares a bit of DNA with last week�s featured �tossing� puzzlers � technically you don�t directly control your pieces, but rather a character/cursor that moves back and forth along the top and drops one blob at a time, straight down. You�ve got to move and act quickly, as the piece you�re holding will begin fidgeting, and then jump on its own, if you take more than a few seconds to decide where to put it. Though you can�t place anything while moving or during a clear, if you stay in one spot you can stack pieces up into a single column almost as fast as you can press the button � this conditional speed boost, coupled with the fact that the game shows you your next 4 colors coming up, is the key to keeping ahead of the competition (if you plan ahead, you can even �speed chain� a little, since nothing will react until you stop placing pieces). Speaking of which, matching colors and putting together chains doesn�t directly attack your opponent, but juices up a �power� meter a la Puzzle Arena Toshinden � once this tops out, garbage is automatically sent your opponent�s way, and the meter empties. It will take longer to refill for your next assault, but the resulting attack will also be more powerful; working quickly to keep the gauge building allows you to �level up� to an assault big enough to send the other side packing. If you take a hit yourself, a keen eye can reveal a ripe opportunity for a reversal � �garbage� blobs are actually just �normal� pieces whose true colors are hidden, so match a set next to them and they�ll change to their original forms. Moreover, when trash pieces drop, they reveal their true identities for a split second � watch carefully when an enemy blitzkrieg arrives, and you�ll know exactly where to aim in retaliation. The above is enough to make for an engrossing puzzler on its own, but there�s even more going on here � for one thing, even if your power meter is only partially filled, you can press the �B� button at any time to spend all the energy you have to execute a weaker attack on your rival. Doing this puts off your next �level up�, but can apply pressure at crucial moments. The gauge can also be expended for defensive purposes: when you see enemy junk coming, hit the button quickly to send an �intercepting� strike to cancel out as much as you can. 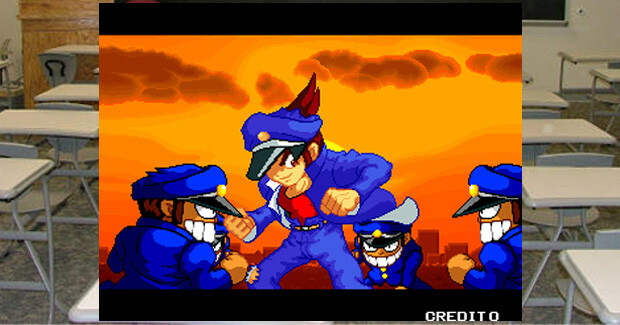 Both options must be used judiciously, since pressing �B� always empties the meter completely, and any �leftover� energy is not retained � if the enemy launches a relatively puny offensive when your meter is almost full, it might be better to take the hit and keep going towards the next attack level, since most of the required power for an �intercept� would end up wasted. By the way, have you been wondering when the Pokemon element comes into play? 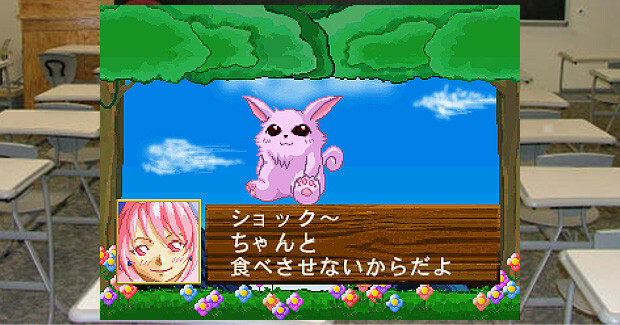 At the beginning of the game you select one of four �trainers� (two others can be unlocked), which determines your initial attack pattern � each trainer starts with a monster egg, which will hatch into one of several critters and then �evolve� into others as you progress. Exactly how this happens is influenced by your mid-match actions � occasionally you�ll receive a �bubble� piece, which you can drop on top of a �normal� one to �capture� it and clear it off the board instantly. The pieces you �capture� are then fed to your monster after the match, and the colors it noshes on determine how it (and its offensive layout) evolves. 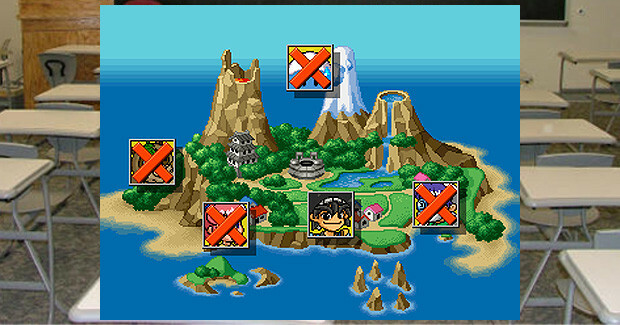 While monsters never really get �stronger�, per se, if you prefer a certain attack method (or just like a certain monster best for some other reason) you�ll want to note which colors lead down which paths, and aim to �capture� the right pieces for the occasion, instead of matching them all up to build meter. Why Should I Play It? � Having read this far you�ve probably already decided whether the �monster-raising� shtick sounds up your alley, but personally I think it�s a pretty cool thing to play around with - even ignoring it altogether adds a touch of unpredictability to how you approach each match as your monster changes along the way. 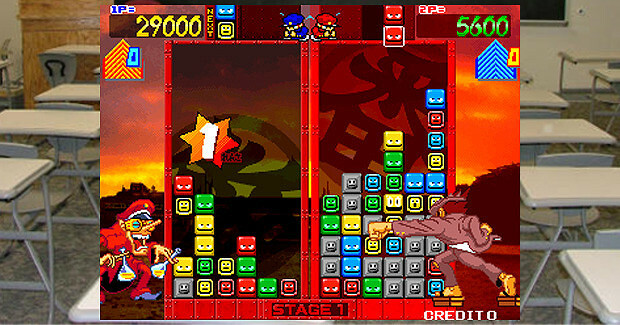 Putting the theme completely aside, Waku�s tweaks to your core �dropping� method encourage a different play style from most ochige � for one thing, since pieces don�t fall from one specific spot at the top, you can sneak around almost any enemy blockade and moreover are not KO�ed until your screen fills completely, providing ample time for a comeback. On the offensive end, constantly shifting all over the place to scatter pieces is not your most effective option, as quick �bursts� of stuff piled in one spot are the most efficient way to build power quickly � keep an eye on the �Next Piece� sequence, and plan ahead to cash in! 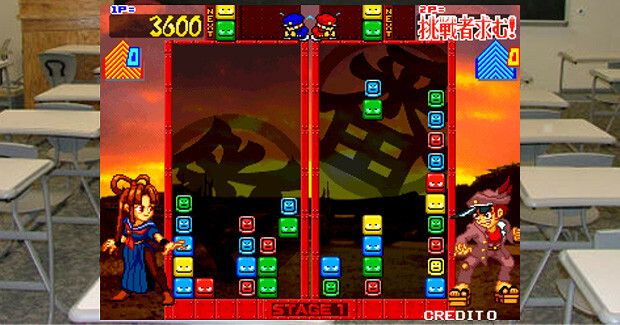 The way this game implements the �attack meter�, however, is my personal favorite part � the ability to attack and defend almost at will keeps things loose and everyone on their toes, watching each other closely to utilize their assets most effectively (the phrase �waku-waku�, in case you�re interested, denotes feelings of eagerness and excitement, and is definitely an apropos sentiment during a heated match). 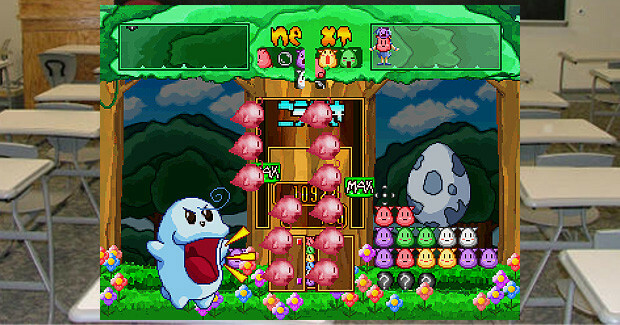 The graphics, for their part, are nothing too special in most respects, but the charm here lies in the little goofy touches; watch your monsters sneak and scamper around in the background as they gather energy, or the losing trainer as he or she clumsily hurtles off the screen at the end of a battle. Music is suitably peppy, but the undisputed stars on the aural front are the Looney Tunes-style sound effects, from the off-kilter guitar �ka-twoong� which plays during the attract sequence to the squeaky �fw-fw-fweet� when you clear out a set of three (just do your best to ignore the constant voice samples). It�s tough not to chuckle a bit as you play - invite some unsuspecting friends over and observe their facial expressions for some extra entertainment. Where Can I Find It? � To the best of my knowledge, Waku only ever appeared on the Japanese Saturn � Wikipedia mentions a PS1 edition, but I�ve found no hard evidence that it exists (it�s not listed in the �Playstation� section of Altron�s site either). On the bright side, the game isn�t particularly rare or pricey, making it an ideal �gateway import� for curious Saturn owners to cut their teeth on. Anything Else? � Off the cuff, Rain Drops is about the closest counterpart to Waku that I�m aware of, though it�s almost as comparable to PuzzLoop in principle. 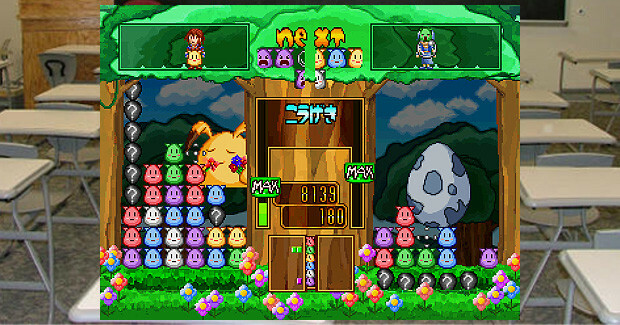 Of course, if you�re looking for �official� Pokemon puzzle games you�ve got the likes of Puzzle League (a Panel de Pon reskin) or Trozei, though ironically neither of them integrates the series� central �monster training� theme into their gameplay as ably as Waku does. If you want to try another puzzler by Altron, from the days before they sank into licensed game hell, the dice-based Rox: 6=Six might be up your alley. That�s all for this week � make sure your chairs are on top of your desks before you leave, or the janitor will start beating me again. Either way, I�ll be back next Monday, and I hope you are too.